A pinched nerve is a compression on a nerve in the shoulder when too much pressure is applied. Pinched nerve in shoulder can be caused by injuries or other conditions. 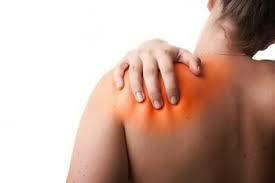 There are a number of things that can result in a pinched nerve in the shoulder. Carpal Tunnel Syndrome.Women are more likely to develop carpal tunnel syndrome, a common contributor to pinched nerves. Large breasts.Women with large breasts are also more likely to have poor posture, another common cause of pinched nerve in the shoulders. Some people are also genetically predisposed to conditions that may increase your risk from developing a pinched nerve. Obesity can also put people at risk for developing a pinched nerve. Excess weight can put pressure on the muscles and nerves, increasing the risk of pinching nerves in the shoulders. Poor posture. Those who are obese may also have poor posture which increases this risk. Pregnancy. Those who are pregnant may also be at a higher risk for developing a pinched nerve in the shoulder because the swelling from the pregnancy can put additional pressure on nerves and nerve pathways. Some medical conditions can also increase the risk of developing a pinched nerve. Rheumatoid arthritis will compress and damage the nerves over time, which leads to an increased risk of pinched nerves in the shoulders. Bone spurs, or bone thickening of the bone from issues such as osteoarthritis can cause the spine to stiffen and limit the space for the nerves to the shoulder, which can cause that pinched effect. There are a few classic symptoms that can tip patients off to the fact that they have a pinched nerve. The arm may feel numb or have decreased sensation due to the nerve being compressed. This can also lead to a "pin and needles" tingling sensation throughout the arm or it may feel as though the arm has fallen asleep. There may also be a sharp, burning pain which radiates out from the area where the nerve is pinched. If the nerve is pinched near the spine, fast motions such as sneezing may cause this pain to become worse, or could result in muscle twitching or weakness. Symptoms of a pinched nerve are often worse when resting or sleeping. If you visit a doctor to get help with a pinched nerve, they will start by reviewing your medical history and the activities that led to your discomfort. Muscle examinations or exercises may be used to determine what range of movement is still available in the arm. A doctor may also perform an MRI or a blood test to eliminate the risk that your discomfort is caused by another underlying condition. Exercises. Once it has been determined that you are suffering from a pinched nerve, there are a few exercises that can be done to help relieve the pain. These are the most effective when the nerve is being irritated by a swollen or damaged muscle. Chin extension. Slowly move the chin toward the chest and down to the right. Hold this position for 10-15 seconds, then relax and repeat on the left side, repeating each side five times. Shoulder shrugs. Following chin extension, place your arms down by your side and then bring the shoulders up to the neck, rotating them back toward the spine, and then rolling them back down. Do a set of 15, then take a 30 second break and repeat as necessary. Bench presses. You can follow shoulder shrug with bench presses. Due to the damage to the body, limit your weight to a broom handle or another light bar. Lie down and hold the broomstick at shoulder height and push it up until your arm is straightened. Repeat this motion 15 times, and then take a 30 second break before starting another set. Medical treatment. Pinched nerv in shoulder should also be treated with a nonsteroidal anti-inflammatory drug (NSAID) such as ibuprofen to help take down the swelling around the nerve. If your pain is severe your doctor can give you a corticosteroid injection in the area where the inflammation is causing discomfort. In very serious conditions where the nerve does not heal after a few months, surgery can be done to remove the bone spurs or to realign the disks in the spine that may be causing harm to the nearby nerves.